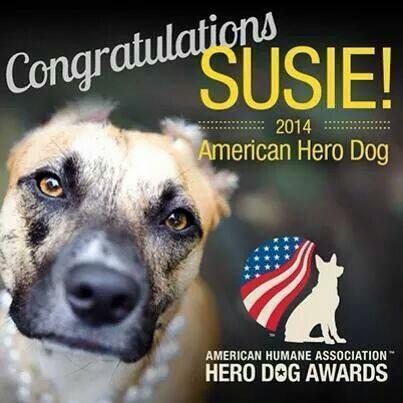 Susie is top dog for 2014! Everybody loves a Cinderella story, and that's exactly what this is - a puppy so badly beaten that she should not be alive, who grew up to become a friendly loving therapy dog bringing hope and inspiration to all she meets! Several months ago I highlighted the eight finalists for the 2014 Hero Dog Award, sponsored by the American Humane Association. There were a total of 135 entries in eight categories. 1.6 million online votes were cast. A finalist was selected in each category. “JJ Krawczyk” was the finalist in the Service Dog Category; “Xena the Warrior Puppy” represented the Emerging Hero Dog category; “Kai” is an Arson Dog; “K9 Kota” represented Law Enforcement Dogs; the Military Dog is a Lab named “Chaney”; “Susie”, a Pit Bull-Shepherd mix, is a Therapy Dog; “Xxon”, a German Shepherd, is a Guide Dog; and “Bretagne” was nominated in the Search and Rescue Dogs group. This past week, the Hallmark Channel broadcast the star-studded awards ceremony, held at the Beverly Hilton Hotel, to announce the Hero Dog for 2014. And the winner is – “Susie”, the Therapy Dog! In 2009, Susie was the victim of extreme abuse. Only eight weeks old, she was beaten, set on fire and left to die. She was found wandering two weeks later with a broken jaw, broken teeth and severe burns over sixty percent of her body. She was taken to an animal shelter where she ended up being adopted and loved back to health. She has no ears – they were burned off – but she does have a law named for her: “Susie’s Law”, which increased the penalty for malicious abuse of an animal to a felony. When the governor of North Carolina signed the law into effect, Susie added her paw print right next to the governor's signature. Today, Susie is a good-natured, loving therapy dog who visits people in hospitals and nursing homes, and children in schools where she is an example that you can overcome adversity. And now this sweet animal that suffered such abuse that she inspired a new law is the 2014 American Hero Dog. Susie’s amazing story of survival and triumph was the subject of a movie, “Susie’s Hope”. You can keep up with her on the website, susieshope.com, and on her FaceBook page. But Susie is not the only hero here. All the finalists are heroes, along with all the dogs that whose owners entered them in the competition, and every canine companion we are fortunate enough to call our best friend, when we’re speaking of pets.